The companion bills aim to present an alternative pathway to the traditional four-year high school diploma. The goal is to have students graduate with industry certification by focusing on career education. The measures were filed by Republican Representatives Wyman Duggan and Tyler Sirois, along with state Senator Travis Hutson. Duggan says the curriculum is ready, and it doesn’t compromise required coursework. “We are not diluting the academic requirements, if you look through the bill. There are still rigorous academic requirements the students will have to meet. But they will now have an alternative option, out of existing curriculum,” Duggan said. The vocational track would have potential for students to graduate in three years provided they maintain at least a 2.0 grade point average, according to Hutson. Students would also have the option to return to the traditional university track if desired. Various industry professionals joined the Republican legislators in introducing their bills as a show of support. 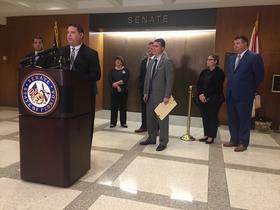 David Hart, the Florida Chamber of Commerce’s executive vice president of government relations, was at the Capitol Tuesday to back the bills. Carol Bowen, chief lobbyist for Associated Builders and Contractors of Florida, says educating those getting ready to enter the workforce on the possibilities within her industry is crucial. In January, Governor Ron DeSantis signed an executive order aimed at boosting career training in the state.